Dr Megan Williams is Senior Lecturer and Head of the Indigenous Health Discipline at the Graduate School of Health. She has over 20 years’ experience combining health service delivery and research, particularly focusing on Aboriginal peoples’ leadership to improve the health and wellbeing of people in the criminal justice system and post-prison release. Megan is a Wiradjuri descendent, and also has Anglo-Celtic heritage. 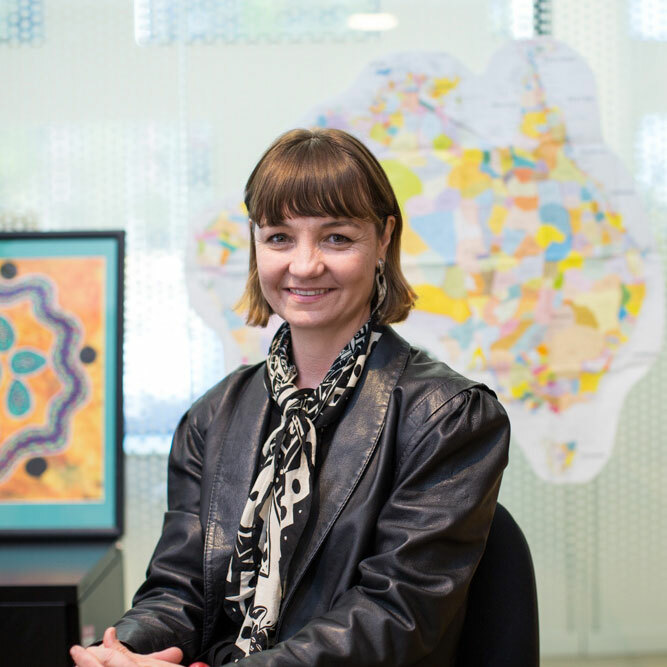 Megan had her work endorsed by the Cooperative Research Centre for Aboriginal and Torres Strait Islander Health under the umbrella of the Lowitja Institute. She contributes to the Ngadhuri-nya (To care for) study associated with the NSW Child Development Study in collaboration with UNSW investigting impats of incarceration across generatons, and an ARC-funded partnership between Ted Noffs Foundation and UNSW. Megan has also designed and published on an evaluation model for Aboriginal health programs - the Ngaa-bi-nya framework. Through the Maridulu Budyari Gumal Sydney Partnership for Health, Education and Research Enterprise (SPHERE) and Croakey.org Megan also focusses on translating research into policy, practice and education. 2010 Lowitja Institute International Travel Award. Co-facilitation of the Critical Friends Circle post-graduate research support, including with a UNSW Learning and Teaching Unit grant. The Ngaa-bi-nya framework presented here is a practical guide for the evaluation of Aboriginal and Torres Strait Islander health and social programs. It has a range of prompts to stimulate thinking about critical success factors in programs relevant to Aboriginal and Torres Strait Islander people's lives. Ngaa-bi-nya was designed from an Aboriginal practitioner-scholar standpoint and was informed by the holistic concept of Aboriginal health, case studies with Aboriginal-led social and emotional well-being programs, human rights instruments, and the work of Stufflebeam. Aboriginal and Torres Strait Islander health and social programs have been described as suffering from a lack of evaluation. Ngaa-bi-nya is one of the few tools developed specifically to reflect Aboriginal and Torres Strait Islander peoples' contexts. It prompts the user to take into account the historical, policy, and social landscape of Aboriginal and Torres Strait Islander people's lives, existing and emerging cultural leadership, and informal caregiving that supports programs. Ngaa-bi-nya's prompts across four domains—landscape factors, resources, ways of working, and learnings—provide a structure through which to generate insights necessary for the future development of culturally relevant, effective, translatable, and sustainable programs required for Australia's growing and diverse Aboriginal and Torres Strait Islander populations. Indigenous people around the world have long healing traditions. Contemporary Aboriginal and Torres Strait Islander healing projects are designed to empower individuals, families and communities; strengthen connections to culture; and reduce the damaging effects of colonisation and government policies such as the forcible removal of children (the Stolen Generations). Evidence on the conditions necessary for healing to occur, and how healing works for different people and in different contexts, is limited. Evaluations that will help identify good practice and document the full range of outcomes are sorely needed. This paper is based largely on experiences and learnings from Stolen Generations projects around Australia funded by the Aboriginal and Torres Strait Islander Healing Foundation, and the reflections of experienced scholar-practitioners. It argues that evaluations that are responsive to, and ultimately owned and led by, Aboriginal and Torres Strait Islander communities need to be designed and implemented differently to mainstream evaluations. Timeframes, methods, relationships between evaluators and stakeholders, and the identification and measurement of outcomes all need to be carefully considered. Challenges include definitions of healing, diversity of landscapes and programs, and data collection. Qualitative methods that preference and support Indigenous cultural frameworks and ways of creating and sharing knowledge work well. In addition to ensuring culturally sensitive methodologies and tools, working ethically and effectively in the Indigenous healing space means emphasising and enabling safety for participants, workers and organisations. Social journalism is an emerging field of practice that seeks to reframe journalism as an action-oriented service built on relationships and collaborations, rather than as primarily content or a product. It offers opportunities for innovation that re-centre the public interest roles of journalism at a time when public interest journalism is in crisis. This article outlines a 10-point model for social journalism, drawing on case studies in health journalism connected to the online platform Croakey.org. These case studies show how using decolonising and participatory action frameworks can transform journalism research and practice, with potential benefits for the health and wellbeing of Aboriginal and Torres Strait Islander people. They also illustrate a dynamic process of knowledge exchange between journalism research and practice. Elements of the proposed model for social journalism practice include: standpoint; transdisciplinary practice; connectivity; relationships; responsive listening; reflexivity; immersion; transparency and trust; creativity and innovation; and an ethic of service and outcomes. It is a model in which transformative health journalism facilitates and enables transformation in spheres beyond journalism. This article also considers the constraints and challenges facing social journalism initiatives and practitioners, and makes recommendations for policy. I've known my dear friend Sandy for several years. He's been like an angel in my life - kind, supportive and trustworthy. Young people with drug and alcohol problems are likely to have poorer health and other psychosocial outcomes than other young people. Residential treatment programmes have been shown to lead to improved health and related outcomes for young people in the short term. There is very little robust research showing longer term outcomes or benefits of such programmes. This paper describes an innovative protocol to examine the longer term outcomes and experiences of young people referred to a residential life management and treatment programme in Australia designed to address alcohol and drug issues in a holistic manner.This is a mixed-methods study that will retrospectively and prospectively examine young people's pathways into and out of a residential life management programme. The study involves 3 components: (1) retrospective data linkage of programme data to health and criminal justice administrative data sets, (2) prospective cohort (using existing programme baseline data and a follow-up survey) and (3) qualitative in-depth interviews with a subsample of the prospective cohort. The study will compare findings among young people who are referred and (a) stay 30days or more in the programme (including those who go on to continuing care and those who do not); (b) start, but stay fewer than 30days in the programme; (c) are assessed, but do not start the programme.Ethics approval has been sought from several ethics committees including a university ethics committee, state health departments and an Aboriginal-specific ethics committee. The results of the study will be published in peer-reviewed journals, presented at research conferences, disseminated via a report for the general public and through Facebook communications. The study will inform the field more broadly about the value of different methods in evaluating programmes and examining the pathways and trajectories of vulnerable young people. Crane, P & Williams, MM 2001, 'Educating young initiates about hepatitis C: Part II', Youth Studies Australia, vol. 19, no. 3, pp. 11-24. Williams, MM & Crane, P 2001, 'The first shot: Part I', Youth Studies Australia, vol. 19, no. 3, pp. 11-24. Williams, MM & Roche, A 1999, 'Young people's initiation into injecting drug use: The role of peer interviewers in risk reduction research', Health Promotion Journal of Australia, vol. 9, no. 3, pp. 213-217. Kinner, S & Williams, MM 2007, 'Post-release experience of prisoners in Queensland: Implications for community and policy', QUT Social Change in the 21st Century Conference Proceedings. Williams, MM 2015, 'Connective services: Post-prison release support in an urban Aboriginal population'.